I think I mentioned before that I am extremely lazy when it comes to my nails. These days though I'm in the mood for some color so I took out the Sally Hansen Insta-Dri nail polish I got, oh, half a year ago! I wasn't even sure if it's still ok to use, since the polishes I've owned before tend to either dry up or curdle when opened and then stored that long. So how was it? Well, it was good as new! You know how nail polish thickens when you've opened it? This doesn't. It's still thin and easy to spread after six months. The Sally Hansen Insta-Dri promises to dry in 60 seconds and it does! But you have to wait a bit longer for it to completely set if you apply a thick layer, around two minutes - still not bad if you ask me. 15 trendy colors to choose from! Chips like crazy. I don't have that much of a problem with the tips, but on the roots of my nails. You can see I edited the photos of my nails a little because the edges are unseemly. Haven't had a chance to retouch yet. 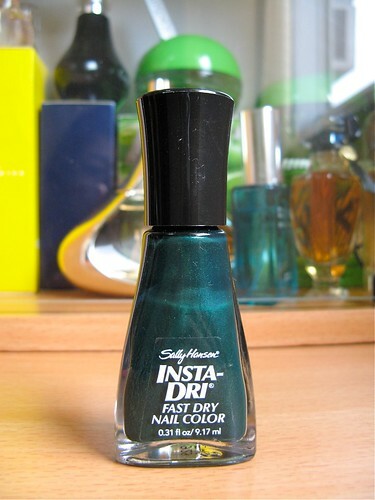 If you're looking for something that dries quickly and only needs one layer to look good, the Sally Hansen Insta-Dri may be for you. It's a decent nail polish, although it's slightly more expensive than the usual drugstore polishes (am not sure, but this is around P300+). I suggest using a top coat to prevent the chipping. 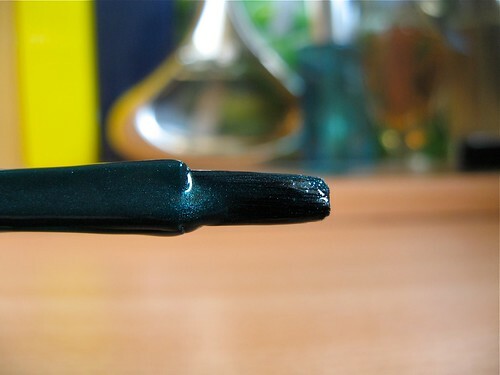 Jumpin' Jade, the color I'm using, is still my favorite out of the bunch I got. 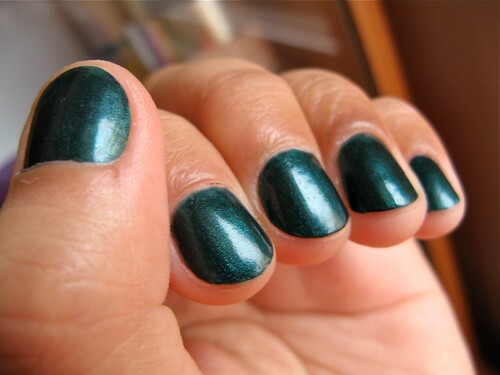 It's a pretty color with fine, darkened blue green glitters that look great under the light. The color looks semi-matte though.